In the fall of 2002, a close friend called me up and told me his mother’s two border collie farm dogs in Pennsylvania had a litter and would I look at taking one of the puppies. At the time, I had two shelties and was just getting into dog agility with the youngest one. So I talked with the mother and saw some puppy pictures and they told me one of the pups had razor sharp focus (and he looked super cute which never hurts). So I agreed to take him and flew him and his sister Brownie out to the bay area, Brownie was going to another friend. I had prepared for him as a good dog owner, there was a crate on boxes at the level of my bed so he could be properly crate trained and still see me when he slept. So in it he went at night and at 3am when I took him out for a potty break, I decided too snuggle for a minute or two when we got back to bed and fell asleep with him on my pillow, in the years since, he has only slept on the pillow with us negotiating his share each night. I went to puppy class and then obedience and then agility class and he was an amazing learner, so much that we started in competition when he was 18 months and before he turned two, he had his master’s titles. Over the years, he had multiple wins at various national championships (AKC, USDAA and UKI) along with many other finals placements. 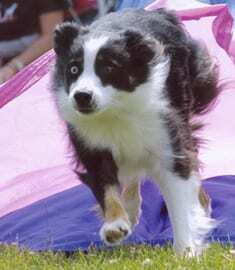 He was a perennial top 10 dog in USDAA and also went to the AKC agility invitational as a top 5 border collie. He also has achieved championship status in the agility venues a total of 26 times over his life. In all the years, he has been just a great companion, very logical and thoughtful and very insistent that I throw the ball, the Frisbee,…. He has forced us to change the doorknobs to round ones (he knows how to open those as well, but has trouble with both turning and pulling at the same time – we had to change the door to the garage so it would open in. He has developed a fondness for beer, which he gets by doing a fake alarm bark, and then runs over someone’s lap on the couch to knock their bottle out of their hand so he can lap it up. When he was 8, I has his dna stored with ViaGen Pets, just in case the cloning technology would eventually get there and I could be sure I would get a truly young puppy. II also wanted to see if he aged well, he has, and as a 12-year-old he and another 12-year-old Luka won the 2 team pairs tournament at the USDAA nationals and he came in 3rd at AKC nationals. He is 13 1/2 now, he still sleeps on a pillow, want to chase a ball and is very insistent on his cookies and on using people as furniture. I look forward to more years with him and eventually a clone of him.